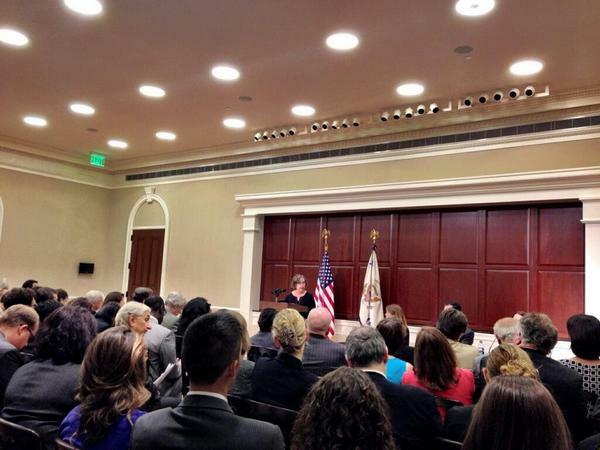 On August 6, Professor Lenni Benson (Director of the Safe Passage Project) addressed a White House briefing in Washington D.C. to discuss how to face the legal needs of unaccompanied alien children. Vice President Joe Biden spoke, as did representatives from AmeriCorps, Department of Health and Human Services Office of Refugee Resettlement, and the Executive Office of Immigration Review. The speakers addressed an audience of one hundred and twenty, with representatives from national law firms, corporations, bar associations, foundations, and non-profit organizations in attendance. Biden stated that the United States has an obligation to give children who have crossed the border the opportunity to make a claim for protection. However, he also acknowledged the difficulty of forming an adequate policy response to such a large influx of children under both international and domestic law. One of the major concerns is the exploitation that can take place on these perilous journeys across the border by smugglers and criminal organizations. Biden has met with Central American leaders to discuss how to educate the populace and advise parents to not let their children take such risks. Professor Benson remarked that while the Vice President recognized the need for comprehensive immigration reform, especially given his experience working in the Senate, neither he nor Ms. Munoz discussed legal alternatives for the child migrants who do not qualify for refugee status. Other government speakers stated that the Administration is mobilizing federal funds and resources to the best of their ability. AmeriCorps will be sending Volunteers in Service to America (VISTA) to support areas that are swamped with legal cases. The Office of Refugee Resettlement, which detains and houses the children, announced that it will make some funds available for direct legal representation for the children who are held in detention. Professor Benson addressed the audience to describe the Safe Passage Project and how it has partnered with the legal community to try to find attorneys for the immigrant children facing removal. As a pro bono project housed in New York Law School, Safe Passage is organized to more adequately meet the influx of legal cases than a law school clinic, which can only take a couple of cases a year. After the White House meeting, a group of lawyers, including members of the ABA Commission on Immigration, pro bono coordinators, and immigration experts met at the offices of Fried Frank LLP to discuss best practices in coordinating and training lawyers. Professor Benson encouraged other organizations to use the resources of Safe Passage to help them work comprehensively and efficiently on the child migrant cases. Written by Amy Zhang, Safe Passage Intern and edited by Astrid Avedissian, Safe Passage Fellow.